Do you enjoy working on craft projects using items that are easy to upcycle? One item that you can use both inside and outside the home for a lot of projects is lattice. 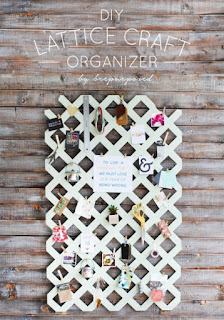 If you have some left over, then you can make a Diy Lattice Organizer. Making a DIY Lattice Organizer is pretty straight forward. All you need to do is cut out a piece of lattice to the size you want for your organizer. However, you will need to use a saw for this step. After you are through cutting, then its time to customize.